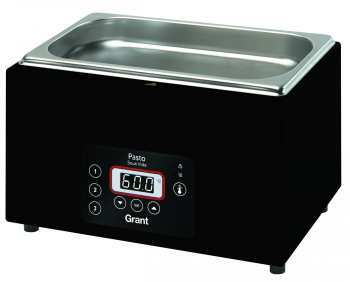 A range of highly durable counter-top sous vide water baths, available in 5, 12 and 26 litre sizes. Indispensable in the busy professional kitchen, the Pasto range offers precision temperature control and stability (ideal for low temperature cooking in sous vide bags) together with a simple and intuitive design. Equally important is the Pasto's economic footprint and easy to use controls, helping chefs deliver dishes of the highest quality time after time. All products in the Pasto range are extremely robust, manufactured in the United Kingdom and come with a 2 year product warranty as standard.